In a week in which the earth moved for all of us, at least to a magnitude of 2.6, we dedicate the Adelaide’s Yesterdays segment to the history and threats of earthquakes to Adelaide. And don’t mention the Richter Scale or Nigel will jump down your throat! Should Adelaide put its name on the hills face in the style of the famous Hollywood sign? The boys discuss this and come up with some novel ideas. What funny old fellows! And we explore why one Adelaide mum has found her toddler preferring simple, non-battery-using toys, particularly a traditional jack-in-the-box. Or should we say devil-in-a-box? That’s Lachlan pictured. Grace Bellavue, a current Adelaide Visa holder is brought before the council again – will she be stripped of her title? There’s also a blind wine tasting that staggers the judges and Daniel Cameron takes us out with a selfless tune. Shout outs: Colin sent one to George Gross and Harry Who. Steve sent cheerio to Andrew Reimer and Liz at FIVEaa now that our update segment is going weekly. Nigel sent shout out to the Screaming Believers. South Australian Drink Of The Week: Mystery drink. Rosemount Estate 2012 South Australia Shiraz. Tasting notes. Stories without notice: Steve: Hollywood lettering, regarding Brenton Bock’s claim that we should have an Adelaide sign in the Adelaide Hills. Interviews: No interviews this week. 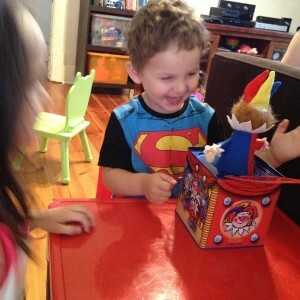 Stories From The Street: Michelle Egan explains how a jack-in-the-box has become her toddler’s favourite toy of Xmas, despite being in competition with flashy, battery-operated ones, and Nigel explains the Brain Theory behind this situation. Adelaide’s Yesterdays with Colin: Nigel shared some facts and stories relating to the great earthquake of 1954. Book referenced is: Strong Shock Of Earthquake: The story of the four greatest earthquakes in the history of South Australia. Brett’s Musical Pilgrimage: Daniel Cameron with Change Their Story.